Markets worldwide will likely react to Spain’s downgrade to the lowest investment rating, as well as the poor opening of the US earning season. General financial uncertainty in Europe will also likely weigh down indices. “Uncertainty around European problems will be pressing the indices till the end of this week. News that could inspire investors in terms of the debt situation in Spain and Greece is unlikely to come in the near future. This means that investors will be cautious about risky assets,” Ivestcafe analyst Liliya Brueva said. US unemployment figures will be published on October 11, and World Bank and IMF representatives will hold a meeting in Tokyo on that date as well. 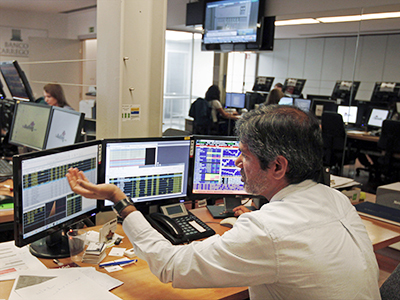 Both Russian indices closed Wednesday trading in the red on negative news from Europe, Brueva said. The RTS dropped 0.71% to 1,483.61, and the MICEX lost 0.82% to end at 1,460.93. 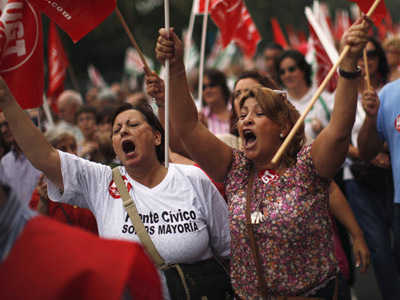 Asian stocks markets were the first to react to the credit downgrade in Spain, the eurozone’s fourth-largest economy. Japan's Nikkei 225 index fell 0.2% to 8,579.68, South Korea's Kospi shed 0.2% to 1,944.79 and Australia's S&P/ASX 200 lost 0.2% to 4,483.60. Hong Kong's Hang Seng bucked the trend and rose 0.3% to 20,979.44. Philippines markets also rose. US ratings agency Standard & Poor's cut Spain’s rating to their lowest investment-grade status: BBB- from the previous BBB+. S&P said the action was due to the country's recession, high unemployment and social unrest, which limit the government's options for reversing the country's financial crisis. 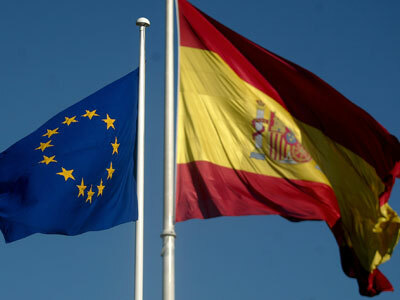 Spain recently chose not to apply for another bailout from the European Central Bank, with Madrid introducing a series of harsh austerity measures in a bid to bring down the country’s budget deficit and convince investors it can manage its finances without outside help. Meanwhile, aluminum giant Alcoa marked the unofficial start to US corporate earnings season by beating earnings estimates, but investors hedged their enthusiasm on the news that the company cut its demand forecast for the year, mostly due to the economic slowdown in China. In another sign of a worsening global slowdown, South Korea's central bank cut its benchmark interest rate and lowered economic growth forecasts for this year and the next. The benchmark seven-day repurchase rate was cut by a quarter of a percentage point to 2.75%. The bank cut its growth forecast for this year to 2.4% from 3%, and lowered its forecast for next year to 3.2% from 3.8%. US stocks also dropped Wednesday. The Dow Jones fell 1% to 13,344.97, the S&P 500 lost 0.6% to 1,432.56 and the Nasdaq dropped 0.4% to 3,051.78. 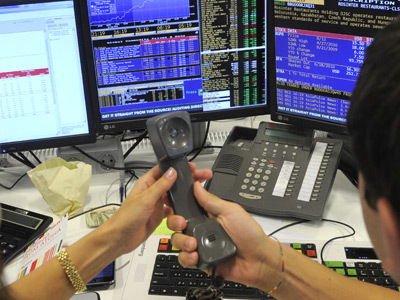 In Europe, the FTSE 100 lost 0.58%, France's CAC 40 declined 0.50% and Germany's DAX fell 0.41%.